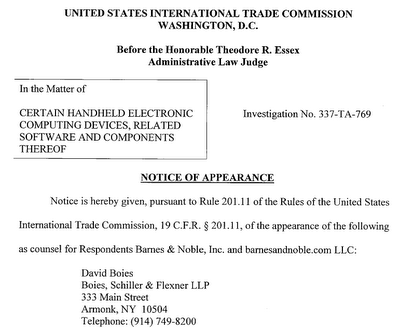 One of the United States' most famous lawyers filed his notice of appearance on Barnes & Noble's behalf in the ITC investigation of Microsoft's patent infringement complaint: David Boies, the chairman of the Boies, Schiller & Flexner law firm, which happens to be one of the two firms representing Oracle against Google. Boies joins a legal team led by Cravath, Swaine & Moore, a law firm that is particularly close to IBM (and vice versa), and Kenyon & Kenyon, a firm focused on intellectual property and especially ITC cases. That team has just recently been complemented by two lawyers from Quinn Emanuel Urquhart & Sullivan, a high-profile litigation firm that also represents Google as a third party in this investigation and the three leading Android device makers (Samsung, HTC and Motorola) against Apple as well as Motorola against Microsoft. his representation of the SCO Group (and still of SCO's bankruptcy estate) in its unsuccessful legal crusade against Linux, which certain members of the open source community claimed was funded by Microsoft. Outside of IT his most recent high-profile case is the representation of NBA players in the lockout fight. Microsoft sued Barnes & Noble in March 2011. The bookseller and Android device maker probably doesn't own patents with which it could effectively countersue Microsoft and has been trying ever since to accuse Microsoft of anticompetitive practices in connection with its efforts to resolve Android's alleged infringement of its patents through license agreements. I guess the primary reason for which Boies is becoming involved is to give this matter a higher profile, but ultimately Barnes & Noble's allegations will be judged on their merits. 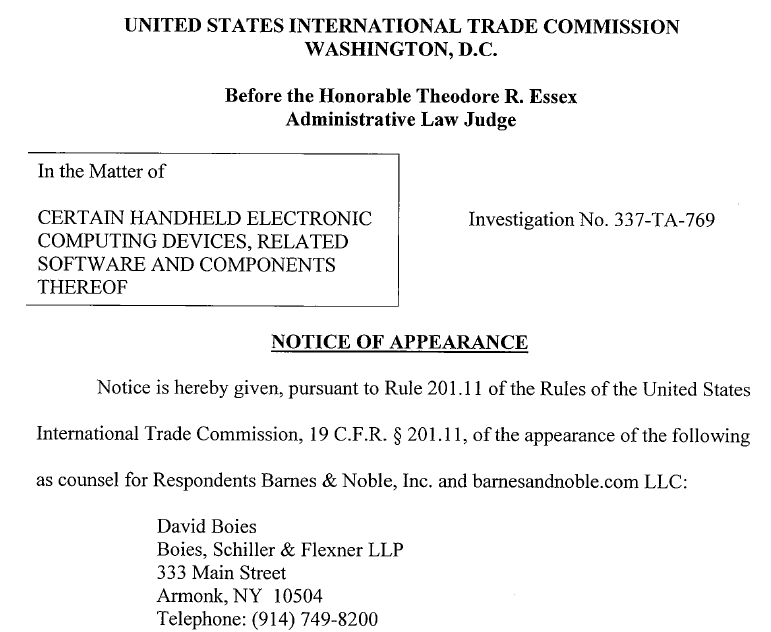 The ITC staff (the Office of Unfair Import Investigations, which participates in many ITC investigations as a third party defending the public interest) supported a Microsoft motion to dismiss Barnes & Noble's "patent misuse" defense even without any discovery. In this context, the OUII (ITC staff) pointed out that patent holders do not have an obligation under patent law to grant a license to anyone: they can always refuse to do so. Microsoft, however, appears to be willing to sign license deals with every Android device maker. Recently it announced that 55% of the Android market is now licensed. Microsoft recently expressed, in a motion filed with the ITC, a belief that there may be a Google hand in Barnes & Noble's defense. I don't know what led Microsoft to think so, but there are indeed only two possible explanations for the huge amounts of money Barnes & Noble's appears to be spending on legal fees in light of the fact that, in strictly financial terms, it's unlikely to recover those fees through lower license fees anytime soon. Either Barnes & Noble's management pursues this as a matter of principle regardless of whether this makes economic sense, which wouldn't be very business-like and therefore appears less likely, or someone else is contributing funds in order to make this litigation reasonably affordable to the embattled company. Barnes & Noble has complained about the five patents Microsoft is asserting in the ITC investigation. However, Microsoft is also asserting more than 20 different patents against Motorola Mobility, and only one of those overlaps with the Barnes & Noble case. On Scribd you can find a PDF file that visualizes the history of Microsoft's litigation with Motorola Mobility between October 2010 and August 2011, and includes reference lists of the various cases and the asserted patents (pages 15-21). I haven't had time to update that document in almost four months, but it still serves the purpose of showing the diversity of Microsoft patents that are actually being asserted against Android in court. In less than three weeks, an Administrative Law Judge of the ITC will make his initial determination on seven Microsoft patents asserted against Motorola. While Barnes & Noble has every right to defend itself vigorously, with or without help from someone with a far greater economic interest in this, I'm concerned that some people may be trying to give a fundamentally good thing -- the concept of patent licensing as a constructive solution to infringement issues that spurs competition and promotes innovation -- a bad name without proposing a viable alternative to licensing. Barnes & Noble argues that Microsoft lost its right to enforce any of its patents against Android due to "patent misuse". In other words, Barnes & Noble takes the extreme position that it doesn't have to pay a cent regardless of whether if it is ultimately found to make use of technologies Microsoft invented and patented. If Barnes & Noble advocated the abolition of software patents, I could see why, but as long as those rights exist, they must be respected. If patent holders are cooperative and reasonable, there isn't a competition issue in my view. If there's no case, it doesn't matter how famous someone's lawyers may be. I can't think of a better example than SCO. Yesterday, Reuters obtained a confirmation from a court spokeswoman of IPCom's ability to now enforce a 2009 ruling against HTC, and meanwhile HTC has issued its most detailed substantive comments on this situation. I think it's great that HTC now talks about this in far more specific terms than in its first two sets of comments. It's important that both sides of the argument explain their views in public so that independent third parties like me can form an opinion. While I still disagree with some of HTC's representations, this is not a black-or-white situation at all and the immediate impact of the enforceability of the 2009 ruling is really a function of HTC's willingness to take certain risks (which is part of life, and especially part of business). I continue to believe that they should try hard to settle this in the very near term, but then my nature is risk-averse. I am particularly happy to see that HTC's new statement effectively confirms the theory I presented right on Friday (when news of HTC's withdrawn appeal broke): the withdrawal was a tactical move on HTC's part to avoid a ruling on two other patents from the same patent family than the one that IPCom is now allowed to enforce. HTC's new statement talks a lot about those two patents and why it was good for HTC and bad for IPCom to prevent the appellate court from ruling on them. But it would have been better if HTC could have been more forthcoming from the start. The news on Friday didn't strike them unexpectedly. They had made a conscious decision to withdraw their appeal, so they had plenty of time to prepare their initial statement. Also, by avoiding a ruling of the Karlsruhe Higher Regional Court on the #100A patent, HTC doesn't stall the process for too long. On March 22, 2012, the Düsseldorf Regional Court will hold a hearing on IPCom's complaints against T-Mobile and Vodafone -- Germany's two leading carriers and almost certainly HTC's two largest German customers -- relating to that particular patent. "There have been a lot of claims made by IPCom over the last few days and we want to set the record straight. While IPCom has continued to try to position recent events as a win for them, the events actually represent a setback for IPCom and their efforts to provide returns to their investors." I don't think the word "setback" is applicable here. If the appellate court had agreed with HTC and thrown out the ruling, that would really have been a setback for IPCom. If the appellate court had decided to stay the case for a couple of years, it would at least have been a setback in terms of a stalled process. But if HTC had been confident of its chances of winning the appeal or getting a stay, then it would have done just that. Howveer, it withdrew its appeal on the last business day before the decisive hearing. At that stage, it had already made 99% of the effort that the whole appeals process required. HTC only had to send a few lawyers to a court session of a couple of hours to get a decision, and didn't want to. The fact of the matter is that HTC felt forced to make a move that has provided IPCom with a fully enforceable court ruling. That ruling entitles IPCom to various things, and quite importantly, HTC now has to provide all of its sales reports in Germany (regardless of whether products are technically infringing or not) to IPCom. And IPCom is now in the driver's seat as far as the enforcement of the injunction is concerned. Even if HTC ultimately convinced the court that its current products are no longer infringing, the price for that may be high. The price may be non-compliance with the 3G/UMTS standard and a loss of all FRAND licensing commitments and license agreements tied to full conformity to the standard. "They are currently leaning on a weak finding from 2009 for which HTC has a design around that does not fall within the claim of the patent as it was defined by the Mannheim Court." What they call a "weak finding" is now a legally enforceable ruling. If they mean "weak" in terms of HTC being able to work around the technical scope of the ruling, one can have doubts about it. In particular, HTC could have presented a workaround to the appellate court, but somehow wasn't willing or able to do so. "HTC remains convinced that this case will have NO material impact on our business." I don't want to dismiss such statements too easily. As a publicly-traded company, HTC has a duty to inform actual and prospective shareholders accurately, and some lawyers must have provided them with a statement based on which they can go out with this "NO material impact" claim. I try not to underestimate HTC. It's a very successful company so far, even though they are now facing significant challenges (which they appear to be quite aware of and ready to tackle). A claim of "NO material impact" could also mean that they are determined to address the problems presented by this particular ruling and weaken their entitlement to FRAND licenses to UMTS-essential patents not only from IPCom but also from other parties. In that case, the business impact could be quite material, but it would be an indirect effect. Had HTC continued with the appeal of the #100 patent, it is unlikely the Karlsruhe Court of Appeal would have reinstated an injunction based on the #100 patent given that the claim of the patent had been found invalid by the FPC, and that IPCom had conceded during the appeal that the amended claim was not infringed." For the first part of the "facts" section, this is not a good start. They somehow try to still justify what they said in earlier statements, even though they now make other, more credible points as well. The asserted patent claim was not found "invalid" in its entirety. It was found valid in a modified form, and while the modified version contains additional limitations, those additional limitations were copied over from another patent claim that a UK court considered essential to the UMTS standard. The modification of the claim in the invalidation proceeding wouldn't have rendered the 2009 ruling useless: there would simply have had to be another analysis as to whether there's still an infringement, or whether IPCom could have prevailed over another claim of the same patent. I think what HTC might indeed have achieved with respect to the originally-asserted patent is that the appellate court might have stayed the case with respect to that patent for the duration of the invalidation proceeding. Concerning IPCom's alleged concession "during the appeal that the amended claim was not infringed", it would be helpful if HTC could present any document that shows this. If HTC had allowed the appellate court to decide, then the ruling would have mentioned this, but HTC didn't want that ruling to come down. "The UK part of the same patent (having the same claim) was found invalid by the English Court in the corresponding Nokia case and revoked in its entirety. IPCom did not appeal the finding of invalidity but sought to amend the patent on appeal – a tacit acceptance that patent claim as granted was invalid." The German Federal Patent Court was provided with a copy of the UK ruling and commented on it but respectfully disagreed. And again, as far as the near-term enforcement of the 2009 ruling is concerned, the pending invalidation proceeding in Germany won't have any effect for the next two years or so. IPCom is now seeking to enforce rights in a patent claim that it knows to be invalid. Again, this claim doesn't help HTC in the slightest. "Despite almost four years of litigation, IPCom has failed to achieve one significant victory against Nokia or HTC and failed to secure any damages." Patent litigation takes time and has a high drop-out rate. For example, Apple and Nokia were suing each other for almost two years before they settled, and at that stage, neither party had scored any victory of any kind, no matter how small. All of the cases were still pending at that stage, and to the extent that any preliminary ITC determinations had been made, those proposed the dismissal of the related complaints. I think IPCom's perseverance is very frustrating for HTC. The sentence quoted above does not take into account that IPCom is now indeed entitled to damages based on the 2009 ruling. Ultimately, injunctions are the leverage a patent holder needs, not damages -- especially in Germany. But this is a demonstrably false claim. IPCom will receive some money based on the 2009 ruling now, and HTC was required (back in 2009) to post a 7.5 million euro bond. "On the contrary, IPCom is liable to both HTC and Nokia for substantial sums in legal costs resulting from its many losses." In terms of what's going to decide the outcome of this dispute, injunctions are at least 100 times more important than damages, let alone legal fees. It seems that IPCom has licensing income from other companies who decided to pay up, and it's using that money to pursue its many lawsuits. That may be very frustrating for HTC, but it's not going to be a solution. "1. Actions under the so-called #173 and #006 patents were dismissed by the Mannheim court, actions under the #44, #90#, #99, #120 were withdrawn by IPCom because the cases were unsustainable, actions under #28 EP, #28DE, #107 and #100Utility Model are stayed pending resolution of respective validity proceedings." I will over time check on those other cases as well. I do know that some of IPCom's actions went nowhere, but like I said further above, that's the way the patent enforcement business works. So far it's not clear that IPCom's portfolio is unusually weak, and if cases are stayed, it just means a delay and not that IPCom is necessarily wrong. HTC actually knows very well what it's like when you bring patent infringement claims and lose. To the extent that HTC's and S3 Graphics' initial complaints against Apple have been decided so far, none of the nine asserted patents yielded a result. Nevertheless HTC keeps defending itself against Apple (as it should). The problem for HTC -- and any other defendant, for that matter -- is that IPCom has more than 1,000 patents from about 160 patent families. They won't get enforceable, non-appealable rulings overnight. They will take some hits and suffer some setbacks. But they don't need a huge number of wins to be in a position to command very significant royalties. "2. IPCom's 'victory' over HTC under the #100 in the District Court of Mannheim in 2009 can hardly be called a victory when the patent claim found to be infringed by the court was subsequently found invalid in the Federal Patents Court. HTC is confident that the German Supreme Court will ultimately uphold this finding." I explained in previous postings that the invalidation proceeding won't affect the enforceability of the 2009 ruling for at least a couple of years, and in my opinion, HTC is likely to continue to have a problem with enforcement even after that process unless it can achieve the complete invalidation of the #100 patent (all claims), which would be a much bigger win for HTC than the outcome of the Federal Patent Court case. "3. IPCom might also claim a victory in the so-called #100a (divisional of the #100) against Nokia in the District Court of Mannheim and the English High Court. However, these decisions are currently under appeal, and at the same time the UK court found six alternative implementations of the UMTS standard not to infringe the #100a patent." I commented on that UK case in detail in yesterday's post on IPCom/HTC. While it's true that the UK court held six implementations to be non-infringing, it's unclear on which scale those were ever incorporated into actual products. The court also refused to take a definitive position on the compliance of those implementations with the official UMTS specifications. IPCom wanted the court to make a declaration on (non-)conformity, but the court held that IPCom wasn't entitled to a decision on that matter. "HTC is respectful of the intellectual property rights of others and has concluded licences with many other essential patent owners. However, HTC considers IPCom's royalty demands to be disproportionate and unjustifiable given the weakness of the patents in its portfolio and the minor importance of the associated inventions to the UMTS standards"
I don't want to be too nit-picky, but the word "other" before "essential patent owners" is actually an admission that IPCom does hold essential patents. That said, it's true that HTC has done license deals with others in the industry, not only other handset makers but also Microsoft. I, too, wouldn't claim that HTC are generally reckless infringers. However, I wonder why HTC doesn't make a legally binding, irrevocable offer to IPCom to take a license based on a FRAND royalty rate, leaving the determination of that FRAND royalty rate to the court if the parties cannot reach an agreement. Under German law, HTC could do so while still denying that IPCom's patents are valid and infringed. The FRAND royalty rate would ultimately have to be reflective of that. The 2009 Mannheim ruling says that HTC offered to take a worldwide, perpetual license to all IPCom patents -- the FRAND-commmitted ones as well as all others -- in exchange for a one-time payment of $10 million. 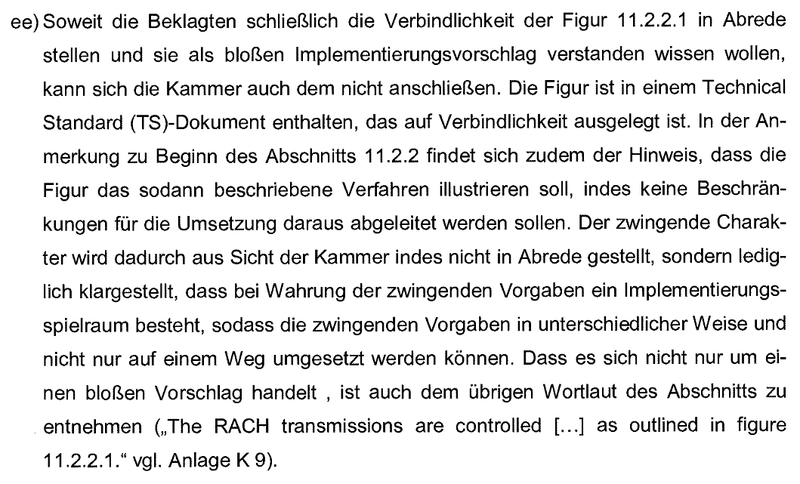 Judge Voß, however, held that IPCom rightfully rejected that offer since it involved patents with respect to which IPCom did not have any FRAND licensing obligation at all. Between IPCom and HTC it's hard to see that IPCom is a FRAND abuser, at least based on what's in the official documents. "IPCom's current strategy is one of desperation because it has been legally outmanoeuvred. It made a significant tactical mistake by introducing the #100a and #100DE directly into the appeal proceedings and now has to start from scratch with those patents in one of the German district courts." In my understanding, IPCom had to introduce the #100A (divisional) and #100DE patents into the appellate proceeding due to Article 145 of the German Patent Act (PatG), which requires a patent holder to assert all patents from a given family in the same proceeding if there's a procedural possibility to do so. Those patents were granted at a time when the case was on appeal, and IPCom therefore injected them into the process. If IPCom had not done so, it would have risked its ability to assert those patents against HTC. It looks like HTC is on the run, especially from the #100A patent. But it doesn't gain much of a reprieve. On March 22, 2012 the Düsseldorf Regional Court will hold a hearing on IPCom's lawsuit against T-Mobile and Vodafone -- Germany's two leading carriers and almost certainly HTC's two largest resellers in this country -- over that patent. IPCom is suing those companies over the sale of HTC's products, and HTC is an intervenor in those cases. "We reiterate our position that the original injunction relates to only one, now-obsolete, handset. HTC's position is supported by earlier rulings of the Court of Appeal in Karlsruhe in other related IPCom cases." I addressed this in a previous post and pointed to HTC's March 2009 statement to the Taiwan Stock Exchange, which contains a clear admission that the ruling would affect all of its mobile phones. "We reiterate our position that we have an alternative implementation of the standard in place, which does not infringe the interpretation given to the #100 patent by the Mannheim Court ." I had previously talked about this. They announced a non-infringing implementation in early 2009 and have yet to show it. Once they do show something to the Mannheim Regional Court, it remains to be seen what the court finds and whether such an implementation is still compliant and compatible with all UMTS networks. "These two points will now have to be argued before the LG Mannheim if IPCom initiates its ‘Zwangsgeldverfahren’." That is correct, and there may be a really interesting hearing in Mannheim in about six months. "Based on comprehensive legal advice from some of the best patent lawyers in Germany, HTC is confident that District Court of Mannheim, will find in its favour. Meanwhile, HTC has planned for all contingencies." Actually, I saw various court documents that indicate that IPCom also works with some of the best patent lawyers in Germany, including a major global player. Ultimately, the court will decide based on the merits, and in the coming months I believe there will be some interesting developments on this front. But there could also be a settlement anytime. Dow Jones Newswires reports that Apple has filed a motion for a preliminary injunction against Samsung's Galaxy Tab 10.1N, and the Düsseldorf Regional Court has scheduled a hearing for December 22, 2011. The Galaxy Tab 10.1N has the same technical specifications as the banned Galaxy Tab 10.1, but a different design that appears to have been created by Samsung's designers in close collaboration with their German lawyers. Quite apparently, Apple believes that Samsung's design modifications didn't go far enough. Presumably, Apple will argue on the basis of both a design-related right (a so-called Community design) and rules against unfair competition. Apple did both of that in the summer, but after the court found Apple's asserted Community design infringed, it didn't have to analyze Apple's unfair competition claims. I think there's a greatly increased likelihood that those competition claims will be discussed at the December 22 hearing. Without a doubt, Samsung will have filed a "Schutzschrift" ("protective pleading"), a document that enables a party expecting a motion for a preliminary injunction from a rival to prophylactically inform the court of its legal position. Samsung also did that in the summer, but based on what I heard from attendees of the hearing and read in a press release issued by the court, that pleading was presumably not too useful. It apparently failed to raise some important arguments. However, I'm sure Samsung's lawyers did a better job this time around. I don't think the outcome of the December 22 hearing is predictable in any way. Samsung clearly upped the ante with its modified design, but even the 10.1N still makes a very iPad-like impression, at least based on the pictures I saw. Anything can happen. From a tactical point of view, it would make sense for Samsung to take a certain calculated risk and find out where the court draws the line. They wouldn't have launched the 10.1N if they didn't see a decent chance of this one being approved by the court, but if it takes them yet another iteration (or more than one) to get to the point of legal certainty, it's worth it with a view to future product generations. Conversely, it also made a whole lot of sense for Apple to attack the 10.1N. Apple, too, needs clarification from the court as to what falls within the scope of its exclusive rights and what doesn't. In order to have any chance of winning a preliminary injunction in Germany, it's generally recommended to bring a complaint within one month of acquiring knowledge of an actual or impending infringement. Some courts, including the Düsseldorf Regional Court, are more flexible and will consider extending that period to eight weeks or even beyond (in exceptional cases), but a plaintiff taking more time than four weeks will have to show good cause. Apple is clearly within the four-week window in this case anyway. With the original Galaxy Tab 10.1, Apple took more time. Only two days before this hearing on the Galaxy Tab 10.1N, the Düsseldorf Higher Regional Court -- the appellate court right above the Düsseldorf Regional Court -- will hold a hearing on Samsung's appeal against the original Galaxy Tab 10.1 injunction. That first hearing could influence the second one in Samsung's favor. Should the appellate court throw out the original injunction, then the Galaxy Tab 10.1N should be fairly safe. But I think Samsung is more likely to defend the 10.1N than to successfully appeal the ruling on the 10.1. On December 8, 2011 (Thursday of next week), the hearing in the ITC investigation of Motorola's October 2010 complaint against Apple will (finally) start. Unlike district court trials, ITC hearings mark only about the middle of the process. A couple of months after the hearing, the Administrative Law Judge (ALJ) makes an inital determination, and a review by the Commission (the six-member decision-making body at the top of the ITC) typically takes several more months. Nevertheless, an ITC hearing is an important milestone, especially (but not only) for the presentation of testimony. Both parties have filed their pre-hearing briefs. As a result, ALJ Thomas Pender feels overwhelmed and inundated, and I can see why. In an order entered yesterday, he notes that "[t]he parties in this investigation have each filed a pre-hearing brief in excess of 800 pages" and reminds them of the fact that he has "scheduled only six days for this hearing (not including Dec. 8), which leaves roughly three days each for [Motorola] and [Apple] to put on their cases". The ALJ asks, quite unerstandably, "how the parties can expect to prove the arguments set forth in such breathtakingly large briefs under such time constraints", and he furthermore stresses that they cannot "expect that [he] can review and make sense of the over 1600 pages of briefs (not including the supporting documents) in preparation for the upcoming hearing". More than 800 pages per party without supporting documents is really huge. But I have seen initial determinations by ALJs that were also hundreds of pages long, not including attachments. Those are complex cases, and in this particular investigation, there's a whole lot at stake. As I write this, Apple's and Motorola's lawyers are presumably working on executive summaries of their briefs, which the ALJ ordered them to file on or before December 1 (Thursday). Each executive summary has a page limit of 50 pages. The order also recalls that Motorola recently moved to drop one of its six originally asserted patents (U.S. Patent No. 5,359,317 on a "method and apparatus for selectively storing a portion of a received message in a selective call receiver". But this is still a huge case. The preliminary junction that the Düsseldorf Regional Court granted Apple against the Galaxy Tab 10.1 on August 9, 2011, became known that same day. Less than a month later, Samsung was forced to remove the Galaxy Tab 7.7 from a trade show booth, a fact that was attributed to a separate injunction. What was not previously known is the fact that Apple also obtained a preliminary injunction against the Galaxy Tab 8.9. That footnote also references the preliminary injunction Apple won in the Netherlands against three Samsung Galaxy smartphones and the dispute that resulted in an Australian preliminary injunction two weeks after Apple's reply brief. I said a few months ago that Apple was collecting those international victories (not only, but to some extent) as trophies in order to make it psychologically and politically easier for an American court to grant a preliminary injunction as well. The fact that Apple highlighted those international achievements in footnote 1 on page 1 of its reply brief in the U.S. lawsuit confirms this assessment. In Germany, Samsung has meanwhile launched the Galaxy Tab 10.1N, a redesigned version that may (or may not) work around Apple's asserted design-related right. On December 20, there will be an appellate hearing on the original preliminary injunction, but the more interesting question at this stage is whether Apple will also attack the 10.1N. The Dutch injunction didn't take immediate effect. Samsung had enough time to modify its operating software. As a Samsung Galaxy user, I, too, noticed the change as a result of an update, but I doubt that many "average users" (average in terms of not being particularly interested in patent issues) even took note. On Friday, an Australian judge heard Samsung's appeal and indicated that the injunction may be lifted over concerns that the initial decision "looks terribly fair to Apple and not terribly fair to Samsung". It's difficult to estimate what the decision in California will be, and when it will come down. Two weeks ago I already wrote that the decision appears overdue (it certainly does now, approximately seven weeks after the hearing), but I also said that it's not possible to conclude from the delay what the inclination of the judge may be. I looked at the redacted versions of Apple's reply brief and its exhibits. Despite tons of missing information, my overall impression is that Apple is not at all unlikely (though very far from certain) to win a preliminary injunction in the United States. At the October 13 hearing, Samsung's own lead counsel had problems telling a Galaxy Tab from an iPad at a certain distance, which impressively supports any theory of confusing similarity. I also feel that a few of the things that Samsung's own experts said in their depositions are useful ammunition for Apple. There may be validity issues with some of Apple's asserted design patents, but if the judge concludes that one or more of those are valid, then I think Samsung is in trouble because Apple has a strong infringement case here and Samsung's public interest argument (including the public interest statements Verizon and T-Mobile submitted) doesn't appear too convincing, even more so since the passage of time has reduced the relevance of all Christmas Selling Season-related arguments (the most important shopping weekend, Thanksgiving Weekend, was last weekend). Yesterday, Judge Lucy Koh was quite active. She entered several administrative orders. I sense we're now really very close to a decision. If Apple wins, what remains to be seen is whether Samsung can design around the scope of an injunction like it tried (and possibly succeeded) in Germany. For example, the Galaxy Tab 10.1N might also have to be considered non-infringing under US law. How will HTC work around the enforced patent without losing the benefit of IPCom's FRAND declaration? Yesterday I reported and commented on HTC's claim that it has worked around the IPCom patent underlying the German injunction, making its current products non-infringing. I expressed my skepticism. Subsequently, one of the numerous companies that have not yet reached an agreement with IPCom on the terms of a possible license told me that no network operator ever implemented the UMTS feature covered by IPCom's patent. This was a serious and very professional source, and I promised to take a closer look at this question. Later, someone sent me an anonymous message via my contact form making a similar claim. I will comment on that one -- and generally on the kinds of anonymous messages I get all the time -- in the final part of this posting. But let's start with the real issue. A compliant workaround would implement the mandatory feature while navigating around the scope of the asserted patent. If such a workaround is not only possible but also viable for all reasonable implementations of the standard, then the patent would not be essential to the standard in a strict sense, but participants in standard-setting processes generally prefer to err on the side of essentiality and it therefore does happen that someone comes up with a way to comply with a standard without infringing a particular patent that used to be considered essential. A non-compliant workaround would, in its simplest form, throw out the patented feature altogether. In that case, the infringement issue would go away. If one assumes for the sake of the argument that no carrier makes use of the related feature on the side of the network, then customers would never notice a difference, making the modified products equally marketable. But even if there was no loss of market potential (which may very well be true), this strategy would trade the infringement issue relating to one patent in for a FRAND issue relating to many other patents. FRAND licensing promises typically benefit only those who implement a standard in full. 100%. No supersets, no subsets, no deviations. That is, by the way, also the case with respect to Java, and since Android's Dalvik virtual machine doesn't implement Java in a compatible fashion, Google is currently not entitled to a license from Oracle on FRAND terms, and Oracle is fighting hard for an injunction against Android. If an implementer of the standard has license agreements in place with any owners of essential patents who grant a license based on full compliance with the standard, he may lose his benefits under those agreements. To the extent he doesn't even have an agreement in place with one or more holders of essential patents, he may lose his entitlement to a license on FRAND terms and expose himself to hold-up. In December 2009, IPCom made a FRAND declaration based on which the European Commission was satisfied that there was, at the time, no need for a full-blown investigation of IPCom's use of the patents it acquired from Bosch. As a result of a complaint brought by Nokia (which was, according to a court document, asked to pay 12 billion euros for a license), there had been "informal discussions" between the EU's competition enforcement agency and IPCom. use any method or operation fully conforming to a mobile telecommunication standard. It's very hard to estimate probabilities of different outcomes. But even the limited information that is available in the form of court rulings provides some indications. Obviously, court decisions aren't always right. But in my analysis I always attach more weight to the findings of judges than to any input I get from companies or individuals, let alone from anonymous sources. A solid majority of court rulings is upheld on appeal. Is a compliant workaround possible? If I were in the shoes of the companies being sued by IPCom over this patent, I would really try to resolve the issue rather than get into that compliance debate that could have all sorts of negative consequences. Based on the documents and reports I saw, it may very well be that a variety of network operators have confirmed to courts that they don't make use -- and never did make use -- of the patented feature. But things are not that simple. The decision by operators not to use the feature doesn't change anything about the fact that all network operators must send certain values across the network because it's required by the UMTS protocol, and those values include a threshold value (which is practically irrelevant if the operator doesn't really use the feature) and a so-called AC/ASC (Access Class and Access Service Class) mapping. T-Mobile told the Mannheim court that it always sends out an ASC value of zero. For that value, the threshold value is, like I said, irrelevant. But each UMTS-compatible device must still process those values and make a determination on whether or not to process the threshold value. An apparatus patent claim covers a device capable of certain performing certain processes, and is therefore infringed even if certain parts of those processes never come to bear due to the data sent from the operator. 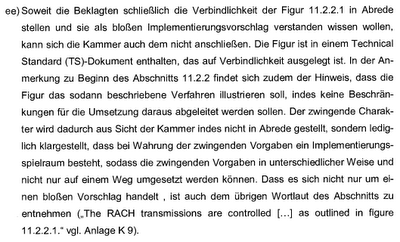 That's why the Mannheim court found that T-Mobile's representations "do not matter" in the infringement analysis. Even if no known operator in the whole world used the feature today, it is part of the UMTS standard and if a device is not prepared to deal with the scenario it covers (a scenario in which access to a particular channel depends on a somewhat more sophisticated process than otherwise), it may not work. So the risk of a workaround is that it may either fail to achieve its objective (non-infringement) or result in actual or potential incompatibilities, and non-compliance. I guess IPCom would prefer a quick win: faced with the choice of having to exit the German market, HTC would presumably pay up rather soon. But if HTC solved the infringement problem in exchange for a non-compliance problem and presented such a workaround in order to prevent the enforcement of the injunction against its current products, IPCom would need to prevail on just one (other) patent that HTC cannot work around, and then HTC will surely want to benefit from IPCom's FRAND declaration. IPCom appears to be persistent and perseverant in its efforts. It already has some licensing income from those who signed up so far, and those revenues may very well cover the cost of its numerous ongoing lawsuits. Many of its patents are still a long way from expiration, so IPCom will probably keep suing and suing for some more time until the alleged infringers take a license. IPCom will have to honor its FRAND commitment, and if Nokia had to pay 12 billion euros, that would hardly be FRAND the way I see it, but IPCom is purportedly willing to enter into license agreements based on terms that a court of law would determine to be FRAND. That, however, is presumably subject to full conformity with the relevant standards. As I mentioned further above, I received a message from an anonymous sender claiming that "[t]he RAHC [sic] related patent that IPCom 'won' on against HTC has NEVER repeat NEVER been even used by the networks" (the message twice stated "RAHC" though the correct acronym is "RACH" for "Random Access CHannel"). Not only the consistent mispelling of the term but also an offensive sender pseudonym, a fake email address (consistent with the pseudonym) and a very emotional writing style show that the unknown sender may need professional help in some respects. I get anonymous messages all the time, also from dubious Twitter accounts, and while I take a quick look at all of them, I never attach any weight to them. I am repeatedly asked to write shorter blog posts or start with the key message, but I'm not going to oversimplify my positions -- at the risk of then being quoted out of context as making demonstrably false claims -- only to please a few unreasonable people. If any investment professional doesn't have the time to dig into all of these issues, I'm gladly available on a consulting basis to provide digested versions of anything in private conversations. I also consistently ignore messages from those who want to push certain stocks or promote the sale of the portfolios of privately-held companies. I'm sure that most if not all of the messages of the kinds I just described come from people with some kind of financial interest in the issues I report on: mostly amateur stock traders, I suspect. I know that my blog is often referenced in discussion forums used by amateur traders, and I actually like that audience for the most part. I also did a certain amount of non-professional stock trading in the past, though I don't touch tech stocks anymore because I don't want to run into any conflict of interest. Some of those messages, including the one I got yesterday about the IPCom situation, may also come from investment professionals. I have many clients in the financial services industry, and all of them are definitely reasonable. But I have also experienced a fair amount of unreasonableness from some members of that community. There are some who freak out when their trades don't work out according to plan, and then they attack people like me simply for raising issues and commenting on them. They're not going to discourage me in any way from saying what I want to say, when I want, and the way I want. Whatever the background of those anonymous senders may be, I want to point out that I'm always receptive to information from industry players and their lawyers. There is no major company in the industry that I wouldn't be happy to listen to as long as it provides relevant and reliable information, and I always protect my sources. I have had background discussions with a variety of major players and will continue to engage in such conversations, provided that one can have reasonable exchanges and also, if necessary, agree to disagree. IPCom's patent enforcement has almost an entire industry concerned, and by extension, it worries many investors. Most of the time, these issues are ultimately resolved through license agreements, and I'm optimistic that HTC will be able to work out a solution with IPCom. But in the event Apple wins an import ban against HTC in a week from today (December 6 is the target date for the final ITC decision on Apple's first complaint against HTC), a license to Apple's core patents may not be available anytime soon. Also, the U.S. market is about three to four times as large as the German one. The much greater threat that Apple's lawsuits pose is another reason for which I think HTC should put the whole IPCom issue to rest sooner rather than later.